Integrated USB 2.0 Interface and Compact flash interface into MAC/BBP for 802.11a/b/g WLAN chipset. The SiS163/163U is a single-chip wireless LAN Medium Access Controller (MAC) and Baseband processor (BBP), which fully provides the feature and functionality needed for the MAC protocol of IEEE 802.11a/b/g standard. The SiS163/163U applies the innovative MAC and Baseband core engine architecture and is designed to provide good performance with minimum power consumption and enhance the advantages of robust system and cost-performance effectively. It is targeted at competitive price-performance, better power management, high volume mobile PC module, PCMCIA adapter card, Compact Flash module,USB 2.0 dangle and build-in notebook system.The SiS163/163U chip contains a 16/32-bit host bus interface which is compliant with Cardbus v7.1, Compact Flash v1.4, Mini-PCI v1.2 and PCI v2.3, a MAC core unit, BBP core unit, WEP,TKIP and AES encrypted engine as well as a physical attachment interface (PAI). Additionally external interfaces include serial EEPROM, GPIOs, LEDs and radio control. The radio interface provides digital and analog signals for transmitting and receiving frame data by means of 2.4/5 GHz radio. The PAI supports direct-sequence spread spectrum physical interface. 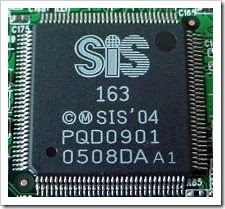 The SiS163/163U implements as a half duplex wireless LAN system supporting all data rates as well as the modulation schemes with differential phase shift keying such as DBPSK (Differential Binary Phase Shift Keying) at 1Mbps, DQPSK (Differential Quadrature Phase Shift Keying) at 2Mbps, CCK(Complementary Code Keying) at 5.5Mbps/11Mbpps, FDM(Orthogonal Frequency Division Multiplexing) at 6, 9,12, 18, 24, 36, 48, 54 Mbps. The SiS163/163U implements the spectrum and transmit power management extensions by IEEE 802.11h standard .The hardware architecture supports advance power management to reduce BBP/MAC power dissipation and features power management software for reducing system power consumption. And .This feature enables MAC, Baseband processor, and RF components to enter sleep mode so that battery life could be effectively lengthened. It is important when wireless local area network (WLAN) devices are adopted for mobile equipments and laptops. The SiS163/163U performs frame exchange protocol, transmit and receive processing, frame encryption and decryption and error recovery capability as defined in the IEEE 802.11b/g standards. It supports BSS and IBSS operation under DCF (Distributed Coordination Functions). Designing wireless protocol systems using SiS163/163U is made easier with build-in flexibility, better software device drivers, the evaluation board, and the completely documents.